You nay have noticed that we had no WAXING LYRICAL post yesterday, given that Mr. Synn was otherwise occupied. Rather than attempt to cobble together a Saturday post myself, I decided instead to get a head start on what will become a two-part SHADES OF BLACK for today, with new music from four bands in this part and four more in Part 2. In this one, I’ve picked two recent full releases and advance tracks from two other albums. Path Through The Mist is a new EP by Volkolun (Волколунь) from Belgorod, Russia, who released a debut album (Only Trees Remember Centuries) five years ago. Though I haven’t heard the album, and therefore had no inkling what might be coming, the EP knocked me over from the first time I heard it. Part of the immediate power of the EP is attributable to the performance of new vocalist Zyx, from the Polish black metal projects Exesa and Zdrada, whose deep, highly serrated growl is absolutely riveting, and capable of expressing tremendous passion. 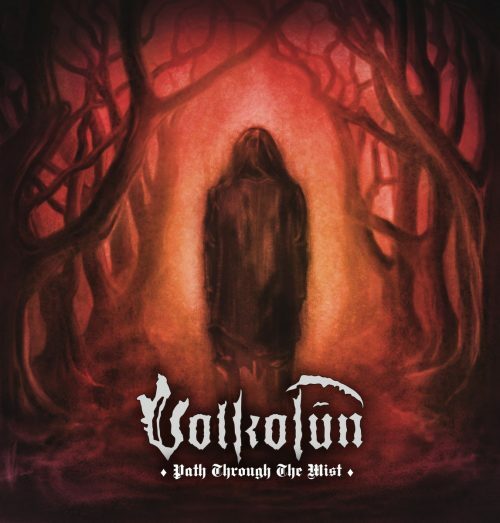 But of course, there is at least equal power in the music created by the solo artist behind Volkolun. There is both warmth and a mystical, dreamlike ambience in the introductory track, but the richly textured “Wayfarer” quickly establishes a heavy, ravaging attack (the bass presence in these songs is immense) laced with dark, exotic, folk-like melody, delivered by a lead guitar that at times resembles the sound of bagpipes, and accented by acoustic guitar and a shining keyboard layer. A mystical aura surrounds “Wayfarer”, too, but the music is also intensely vibrant and grows increasingly fierce. “Zmora” is the song set to play first in the Bandcamp stream, and you can understand why once you hear it. It’s a gloriously fiery track that rushes like a stormfront, and the flickering lead in the song burns with delirious emotional intensity, edged with pain. It gets the pulse racing, though it’s also shaded with gloom. After the blazing surge of “Zmora”, “Her Majesty” provides a contrast. It’s a more mid-paced and majestic song at first, but one that’s full of heart-ache and grief. It’s hard to know exactly what instruments play a role in this song, but the sounds resemble a combination of flute, fiddle, and bagpipe. As the song moves ahead it grows more and more powerful, and more and more head-moving, especially as a big jabbing riff surfaces in the back half. I thought “Zmora” was intensely memorable, but “Her Majesty” may be more memorable still — a work of dark and soulful grandeur. This is a very fine EP that has really gotten under my skin, and I hope you’ll enjoy it too. Here’s another release that floored me from the very first song. 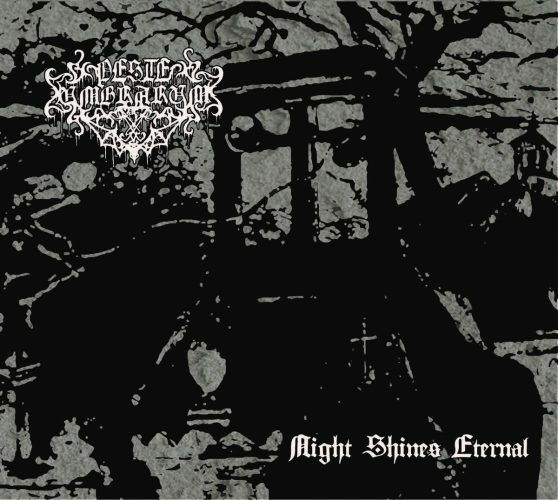 Entitled Night Shines Eternal, it’s the debut demo by Peste Umbrarum, a Portland, Oregon band that includes members of Panzergod, Death Fetishist, and Deathsaw, and former members of Daemoniis ad Noctum, Cult of Unholy Shadows, and Hiding. That very first song is the title track, and it’s breathtaking. From the first seconds, the drumming flies at near-inhuman speed and the bass rumbles at an equally rapid pace, while the guitars twist, spiral, and soar in displays of unearthly ecstasy. The wild abandon of the guitars is matched by the scalding, shrieking lunacy of the vocals, and when the hell-for-leather pace briefly abates, the music becomes even more eerie and ominous. The track manages to be both explosive and mesmerizing, technically demanding and deliriously exuberant. A hugely exciting way to begin the EP. It probably would have been a mistake to follow that startling start with another extravagant fireworks display, and what the band do instead is begin “Umbrae de Gallows Dolor” with a haunting ambient introduction that both allows the listener to catch a few breaths and puts a chill on the skin. When the song truly begins after a brief pause, it manifests as a slow, doomed stagger, the vocals expressing a wrenching agony, and the guitars bleeding a sense of utter desolation. Even when the intensity of the song increases as the drums thunder and the riffing becomes more frenetic, the music is still piercingly anguished (though at times it also dances and soars). In its own way, “Umbrae de Gallows Dolor” is just as stunning as the opener. “Dead to World” is the shortest of these four tracks, but also makes a hugely favorable impression, alternately stomping and erupting in conflagrations of chaos, and the shrieking vocals here are joined by gruesome guttural roars. There’s an absolutely magnetic and maniacal lead that seizes the spotlight near the middle of the song and continues to boil in a display of glorious derangement as the drumming goes crazy along with it. This is a substantial demo in many ways, not least of which is its substantial length. The final track, “Across Seas of Sorrow and Time“, is the longest at more than 10 minutes. It builds from a bereaved and beguiling introductory passage that features a piano performance and soaring tones that resemble an angelic choir. Even as the full band join in, the music remains haunting, though much heavier, but the vocalists’ harrowing cries and roars foreshadow a volcanic eruption of boiling torment. There’s an almost panoramic, sweeping quality to this expression of suffering, and an air of unsettling arcane mystery pervades the song as the tides of sound ebb and flow. This demo really is a stunner, powerfully expressing a range of moods from debilitating depressiveness to incendiary euphoria. If I had to sum up it up in a single word, it would be this one: Magnificent. 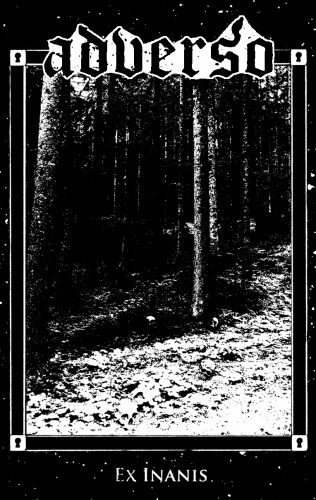 Ex Inanis is the second demo (after last year’s Bringer of Death) by the Portuguese black metal band Adverso. It consists of four tracks and almost 22 minutes, and one of those four is now streaming. Shot through with abrasion and cloaked in the choking shadows of death, “Consummatio” is a staggering, mid-paced march that creates sensations of oppressiveness, foreboding, and merciless hostility. The vocalist’s wild cries and throat-shredding shrieks channel unhinged emotional affliction, while the slowly warping leads make use of dissonant melody to strengthen the song’s eerie atmosphere. The mood of emotional desolation persists even when, nearing the end, the band throw themselves into a convulsion of blasting drums and blazing fretwork. Intense music that makes a deep impression. Ex Inanis will be released by Purodium Rekords on October 15th. “Temple of Pervading Darkness” is the name of the last track I’ve picked for Part 1 of this column. It comes from Panphage Mysticism, the debut album of the Finnish band Mørketida, which was just released late last week. On the Bandcamp page for the album, “Temple of Prevailing Darkness” is the lone track available for streaming as of this writing. As both the name of the song and the title of the album suggest, a spectral, supernatural aura cloaks the music on this track. It begins in a slow, stalking pace but the drumming soon drives it to a fever pitch of surging power. The waves of eerie music crest and fall; the vocals are themselves ghastly and ghostly; and the booming undercurrents of the rhythm section in the slower movements are heavy enough to crack bone. There’s a disturbing kind of grandeur within the forest shadows of this music, even though it’s crushing in its moods of hopelessness, and mind-fracturing in its hallucinatory manifestations of despair. P.S. After writing what you’ve just read, I discovered that the entirety of Panphage Mysticism is currently streaming at Indy Metal Vault, where you can also find an interview of the band. The album is available now from Werewolf Records.